We're happy to announce a partnership with CGI Communications to produce state of the art videos to help showcase our great community and our wonderful businesses. Click here to learn more. To enroll for robocalls, text message alerts, or community eblasts, click on the button below. The central mission of the Community Engagement and Public Information team is to be the connection between the City of Oak Park and its community members to convey, share, and support dialogue on as much relevant information as possible in regards to municipal programs, services, developments, activities, and events. The function of this team is to inform, educate, entertain, encourage, support, and engage community members. Understanding that not everyone wishes to interact with their municipal government on the same level, this team supports and promotes varying levels of communication, interaction, and participation. 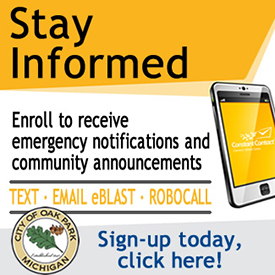 If you are new to the City of Oak Park or if you are a current resident that may have missed the latest developments, no worries - you can Stay Informed here. If you're not sure which department to contact to help you with any number of issues, check this City Directory. Give us a call or stop in - our staff will be happy to help. Stay informed with all the City's events and activities for the current month with this Calendar of Events. Stop by - there's sure to be an event for everyone to enjoy! Feel free to Contact the Community Engagement and Public Information team with issues, concerns, questions, or anything else related to the City of Oak Park.